Lock in a great price for Harmonie Embrassee – rated 9.2 by recent guests! Location is great. Staff is outstanding. Rooms comfortable. View was a bomus. staff were very helpful, room was very clean and large balcony ,very easy to get to Osaka and Shin-Osaka stations . one word Superb. The room is clean n comfortable, staffs r all friendly n nice! Thx that Chinese staff at reception, he really helped a lot! Breakfast is tasty! Next time when I back to Osaka, I still will choose this hotel! It was quiet yet still close to the action. The balcony was spectacular. The staff was top notch and made us feel welcome. Staff is very welcoming and accommodating. 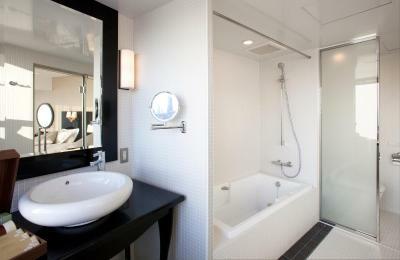 The room was fantastic with a large bathroom and tub that overlooks Osaka. Wrap around balcony was also a great way to take in the city. Everything is perfect, the staff are very courteous, attentive and helpful. The best service which is far exceed our expectation. Special thanks to Yukari, who spent more than a hour on the phone helping me with Vaio customer support. We also enjoyed our visit to the Sky Chapel on the top floor! The service was excellent, staffs are very polite with good service mind. It was definitely one of our best hotel in Japan (service and location are great). Doorman at the gate helped with all of our luggagrs and led us to the lobby on the 10th floor, where we checked in with a delicious welcome drink. The reception desk has high glass windows, where you can enjoy the beautiful view of the city at the same time. The whole day tiredness of travelling just swept away. The staff are extremely organised, attentive and friendly, we were very impressed. For our special trip, hotel upgraded our room to a very nice suite with an amazing view (most walls are high glass walls) and a Jacuzzi with 360 degree city view. The whole stay was very enjoyable and we had a wonderful time. Harmonie Embrassee This rating is a reflection of how the property compares to the industry standard when it comes to price, facilities and services available. It's based on a self-evaluation by the property. Use this rating to help choose your stay! Located in Osaka, Harmonie Embrassee offers free WiFi access throughout the property. This 4-star accommodations is located just a 3-minute walk from Hankyu Umeda Station and a 10-minute walk from JR Osaka Station. Each spacious room have a modern decor with a wardrobe and flat-screen TV. Guests can find an electric kettle, refrigerator and coffee machine in all rooms. Each bathroom is equipped with a bath and shower. Guests will find bathrobes as well as a hairdryer and free toiletries. Luggage storage service is available for guest's convenience. Trouser press service is available for free. A Full English/Irish breakfast is served daily at the property. Guests can enjoy the on-site restaurant featuring French cuisine as well as an on-site cafe overlooking a garden terrace and city views. Namba Station is a 17-minute train ride away. Tsutenkaku is a 30-minute walk and train ride away. Shitennoji is 33 minutes away by walk and train from the hotel. Osaka Itami Airport is a 30-minute train ride, while Kansai International Airport is a 70-minute bus ride away from Harmonie Embrassee. When would you like to stay at Harmonie Embrassee? House Rules Harmonie Embrassee takes special requests – add in the next step! Harmonie Embrassee accepts these cards and reserves the right to temporarily hold an amount prior to arrival. Very spacious hotel. Never stayed in a Japanese hotel with a room this big (and at this price point). Very competitive pricing. Well trained staff and generous amenities. Location little walk from Umeda station but surrounded by a lot of shops and restaurants - worth a little walk. Will be back. I was really impressed from the service and attitude of service personnel in this Hotel. I have never experienced so kind and attention behavior even in 5-star Hotels. And in general - everything is beautiful and convenient in the Hotel. The room, view and location was great. The staff were great, the room was perfect. So clean and spacious, and great city views at night. The beds were comfortable and everything I could possibly need was supplied. Service is amazing, beautiful room, every amenity you could want, balcony with view. Excellent breakfast. The hotel was immaculately clean and comfortable. The staff was very kind to provide tailor made local information on the spot and produced a package of information that was highly useful. The spacious bathroom tends to get bit chilly at night and the huge balcony sliding door tends to allow slight draft of cold air to enter room, might only be a slight issue during winter. Had a couch in living area, should have included a small coffee table. Room was very spacious and located on high floor of property offering a very good view of the Osaka city scape; room had a really long balcony (see photo). Biggest room I stay during my trip to Osaka, definitely good value for the price I paid. Location in Umeda is great being very close proximity to tons of shops, restaurants, train station (6-8mins walk) and airport limosine bus stop (getting to and from airport much easier on airport limo). Just diagonally opposite a Loft departmental store (abt 100m) Staff was always friendly and helpful especially the concierge on the ground floor. Property also has parking available (charges apply). Quality toiletries offered was extensive, everything you might need was provided. A map to the hotel from Osaka Station would be good to have. Harmonie Embrassee has a luxury boutique feel that exceeded our expectations. Our room was spacious, with a big bathroom and very comfortable beds. The staff was very professional. The room was an excellent value for a reasonable rate. Professional staff. Groomed and perfect. Really it is boutique style! Location, room with balcony, Bulgari toiletries, free mini bar drinks, room size is big. Location. Though it is located near the shopping area, it is a good 10 mins walk from the nearest train station. As it is located near the Ōsaka station instead of Shin Ōsaka, it requires a change in train before traveling to Tokyo or Nagoya. Except for the location, the room and toilet were large for Japan hotels and the facilities were good. The room was big and the beds were comfortable. The facilities provided were good.